Today I've joined with fellow Aussie blogger and instagramer Natalie from Cats n Nails. 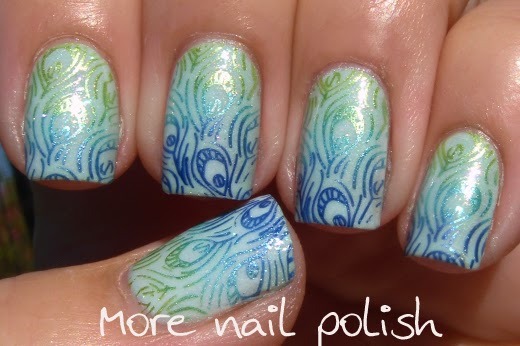 Natalia suggested we create a gradient nail stamp mani using full nail stamp in bright colours over a light base. 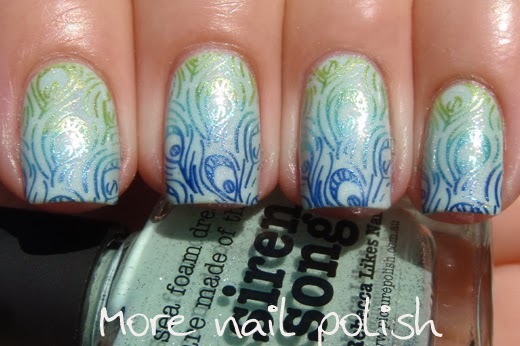 The inspiration came to Natalia from @sveta_sanders and this great mani and tutorial. I chose a base of Picture Polish Siren Song and then stamped using Kleancolor Metallic Green, Metallic Aqua and Metallic Sapphire, using the peacock plate from Emily de Molly EDM04. Don't forget to jump over and check @Cats_n_nails instagram feed to see what she came up with for her twinsie matching nails. Ooh I'm so glad Sveta's idea became popular! She is really gifted at stamping. By the way, she has a blog as well - hope you will not regard this comment as spam - her blog is lakoman.blogspot.ru ("lakoman" is the Russian for "nail polish addict"). This looks awesome! 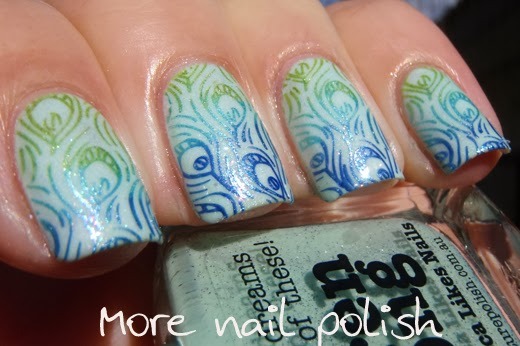 This has inspired me to play with my Kleancolor Metallic stash for stamping. I bought them for that purpose, but have yet to play with them!